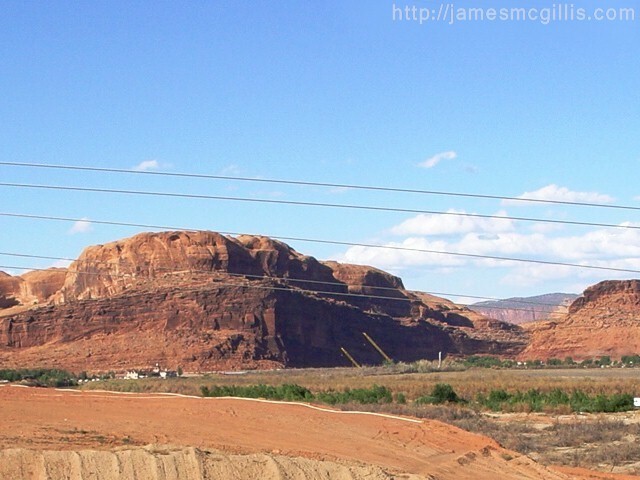 On October 6, 2012, I was busy with two projects in Moab, Utah. By noon that day, I had two live webcam operating Behind the Rocks at the last and final 24-Hours of Moab Off-road Bicycle Race. As soon as I had the webcam images of the race streaming properly, I headed for my base camp at the Moab Rim Campark. After a quick cleanup, I dashed off to the Canyonlands by Night pavilion on the banks of the Colorado River. Travel in time through the North Portal of the Colorado River, Moab, Utah. Now called Canyonlands by Night & Day, in 2012 the company celebrated its forty-ninth year as a river tour operator in Moab. With their unique floating dock, flat-bottom excursion boats and high-speed jet boats, the company offers a wide variety of tours both up and down the Colorado River. In the early 1970’s, Canyonlands by Night was already an established tourist attraction. In the early days, their most popular tour was a night visit to the Colorado River Canyon, downstream from Moab. With powerful lights played upon the canyon walls and music to match, it was a multimedia experience unique to Moab. I had met Evan Haworth several years ago, while dining at Pasta Jay’s Restaurant in Moab. In conversation, I discovered that Evan and I had something in common. We both played traditional wooden Indian flutes. As it turned out, I am a novice and Evan is a master flute player, internationally known in the realm of the wooden flute. In those early days of Facebook, we "friended" each other and kept in touch from time to time. In October 2012 I found a special reason for taking the Canyonlands by Night “Dine & Unwind” tour. In September, I received word that Evan would be playing the flute alongside Gray Boy, his Native American friend and master of the Navajo Hand Drum. That Saturday evening, Evan Haworth and Gray Boy were to play live on the new “Dine & Unwind” dinner tour at Canyonlands by Night. After rushing to the river, I was the first guest to arrive for the tour. A few minutes later, Evan and Gray Boy approached, dressed for their performance. Soon, a busload of French tourists arrived and we boarded our boat. With forty guests, plus crew, we headed upriver in the open-air excursion boat. Almost immediately, we passed beneath the new U.S. 191 Highway Bridge. Actually, there are now a pair of identical bridges in place there, separated by a narrow gap. In order for traffic to keep rolling during bridge construction, engineers first built a new southerly span of the bridge. After switching traffic to the new span, engineers demolished the old highway bridge. With all of their experience constructing the southbound span, the new northbound span took far less time to build. To motorists crossover over either span, each side appears to be part of a greater whole. 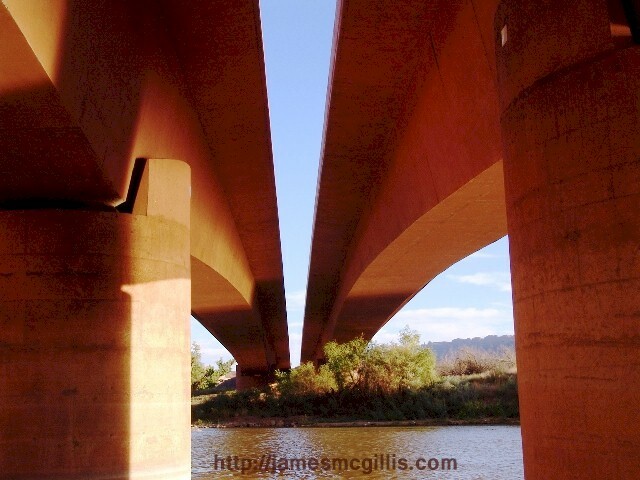 From our vantage point, we could see dual structures arching gracefully over the Colorado River. With their concrete spans and massive center supports, the color-matched bridges created an impressive sight. Earlier in the season, there was sufficient water in the Colorado River for the boat to travel unimpeded upstream. After passing beneath the highway and bicycle bridges, I noticed that the water level on the Colorado River was near its all-time low. About a mile upstream, our shallow-draft excursion boat could go no further. Ahead there was a rock-shelf in the river bottom over which the boat could not pass. Taking advantage of the slow current, our captain centered our boat in the river, with the bow pointing upstream. As the sound of the engines died, Evan Haworth and Gray Boy began for their performance. Between each song or chant, the captain swung the boat back into upstream position, preparing for another slow drift downstream. As I looked through my viewfinder, the late afternoon sunlight played tricks with both my eyes and the video camera lens. 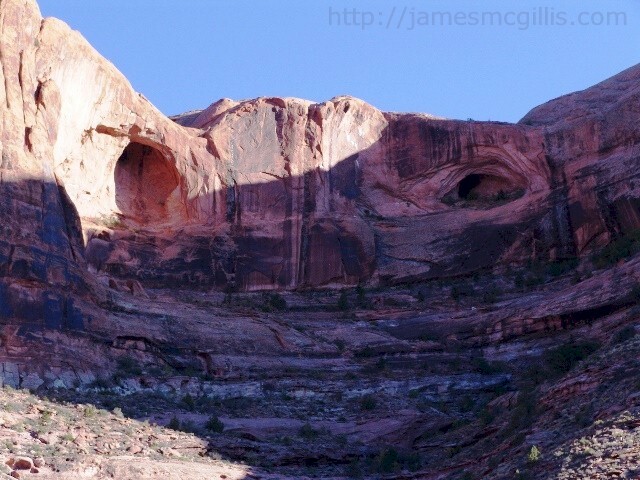 As Evan played his first number, my eye caught the image of an Ancient Spirit up on the canyon wall. Known locally as “ET, the Extraterrestrial”, the Spirit of the Colorado Riverway is visible in the video accompanying this article. Next, Navajo elder, Gray Boy performed solo, rhythmically playing the hand drum while chanting in Dine' Bazaad, his native Navajo language. As a young man, Gray Boy departed the Navajo Reservation to the south, traveling to Moab and there finding a good life for him and his family. Now, thirty years later, Gray Boy worked as a maintenance person at Canyonlands by Night & Day. Earlier in the season, musicians scheduled to play on a river cruise were unable to perform. In his unassuming way, Gray Boy offered to play the drum, while his friend Evan played flute. The rest, as they say, is history. Now, during the season, Evan Haworth and Gray Boy often play together on “Dine & Unwind” dinner tours. If you plan to visit Moab, be sure to call ahead and see which days they will play, as theirs is still a limited engagement. Once the world discovers this unique experience, I expect to see the pair perform several times each week. If you had walked the banks of the Colorado Riverway one or two thousand years ago, you likely would have heard both flute and drum. 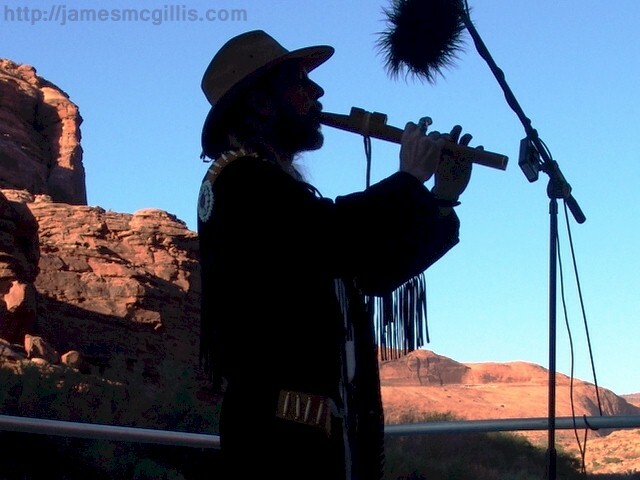 Throughout Canyonlands, those were and still are the primary musical instruments of traditional Indian culture. For a sampler of what you will see and hear on your own “Dine & Unwind” tour, please watch the accompanying video. For several years now, I have studied and written about various energy bridges in and around Canyonlands. In my concept, an energy bridge allows us to experience vibrational energies that existed in that place, but at a different time. That particular time we may say is in the future or the past. The key to the energy bridge concept is that we can feel past, present and future, all right now. While listening to the timeless music of flute and drum echo from the canyon walls, I realized that the new highway bridge serves a dual purpose. 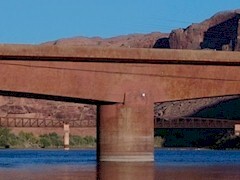 On one hand, it conducts traffic across the river, north of Moab. On the other hand, the the dual arched spans serve together as an energy bridge to the culture of the Ancients. 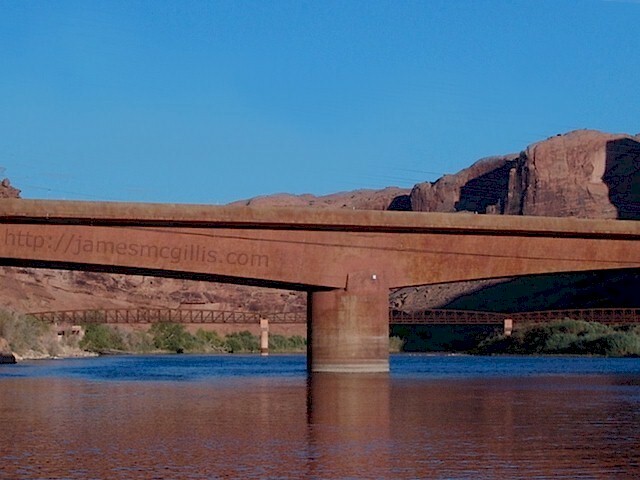 After passing under the Colorado River Bridges, our boat headed up through the North Portal of the Colorado River. As we motored farther up the canyon, we were just in time to enter the timeless realm of the Ancients. On our return trip, we passed again under the energy bridges. As we transited beneath the bridges, the sun was setting behind the Moab Rim. With fractals of new energy light captured by my still camera, the concept of an energy bridge seemed real enough for me. If only, I thought, we could capture that new energy; think what it could do for our world and us. As rapidly as our upstream passage had sent us all to another place in time, we found ourselves back at the Canyonlands by Night, disembarking on to the floating dock. Shifting as we had from one earthly dimension to another in so brief a time, we had all worked up quite an appetite. Luckily, an excellent chuck-wagon-style barbecue dinner awaited us in the riverside dining room. At dinner that evening, I sat with Evan Haworth and Gray Boy. As we unwound from our mesmerizing upriver experience, I again felt the attraction of the energy bridge. 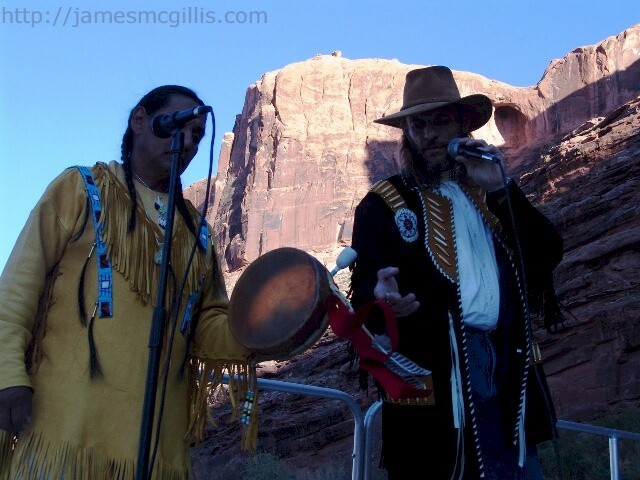 Suddenly, it was two hundred years before and I was sitting at a rendezvous between a mountain man and a Navajo elder, discussing their music. Since that ancient day, I thought, not much has changed. Being with friends while listening to live music on the Colorado River is as pleasurable now as it ever was.